It's probably no surprise that many of our new year resolutions involve spotting and trying out new home design trends. Styles and looks are constantly evolving which keeps our designers on their toes. We like to find new ways to incorporate these shifts and make homes feel cozy and lived-in while still being current and well-designed. As we look to the year ahead, we're seeing more natural, rustic elements—think wood paneling and terracotta floors—with a mix of earthy and soft colors. We love making things feel as natural and organic as possible, so we're definitely on board with this trend. We're also seeing interesting patterns (hello, plaid!) and a variety of textures. There seems to be a move toward more traditional design with a nice blend of vintage (rugs, lighting etc.) to bring that eclectic look to a space. Needless to say, we're lucky to have a great trend spotter amongst our ranks, Elite designer Heidi Caillier, and have asked her to share with us the top trends she is seeing in home decor. Here is her trend forecast for 2018. Painted cabinets are beautiful but expect to see integration of natural wood tones in kitchens and bathrooms. I see the trend happening both on its own and then also paired with painted finishes to create dynamic spaces and a layered effect. And we don't mean white! Think natural, organic tones that you see in nature. We are seeing a lot of mushroomy taupes, earthy washed out greens and lavenders, muddy duck egg blues mixed with softer neutrals. The effect feels mature and softer than the glaring whites that have been so in the past few years. While there will always be a place for cement tile the day has come for something new. The turn is toward more organic materials with a living finish and a natural vibe. We are loving using terra-cotta in unexpected places where hardwoods may not be an option (think family rooms! ), layered with rugs to cozy it up. We see the trend moving away from mid-century and towards integrating more traditional shapes and forms. 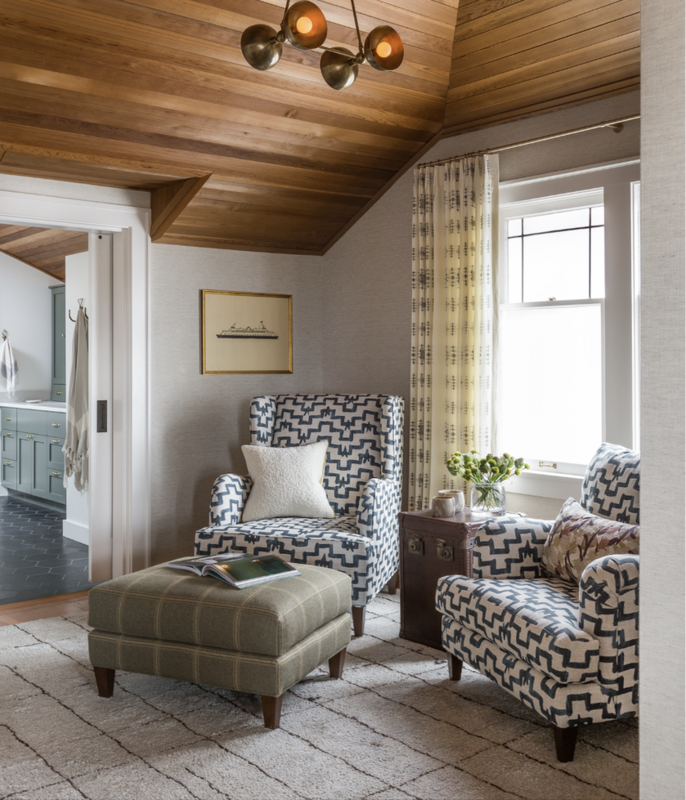 Rounder edges and attention to details in upholstery with welting and trim, rich wood tones, pleated or tapered lampshades, wingback chairs, spindles. We love this trend and cannot wait to bring it into our projects. Think inset cabinets, vertical paneling, wood accents, aged brass finishes and marble. Beautiful and charming (sorry, French) ranges and vinatge rugs. We're seeing cabinetry in a variety of colors from white, to soft muted greys, to blues, greens and blacks but softening the space with warm accents and vinatge-inspired pieces. All day everyday. In its more modern iterations or the traditional versions. It looks fantastic mixed in with different patterns and is a great way to bring in a wide color palette. Expect to see it in a big way across all platforms. We see the use of vintage pieces being used to round out spaces and bring in a bit of an eclectic vibe. Whether it's a great chair or light fixture, this look feels very collected and helps make cutter cookie design a thing of the past. Thank you, Heidi, for these great home design trends. Now, if you're feeling inspired and what to get your home up-to-date in 2018 then start your own room project today!